Are you tired of walking on outdated floors? Does your interior décor need a new look? If you’re looking for superior hardwood flooring for the best value then look no further than our local store. At our showroom, we feature an assortment of options, including engineered hardwood flooring and solid hardwood flooring that are both sure to enhance the look of your property. 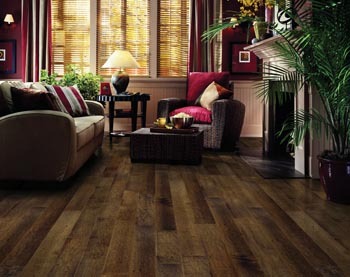 Consult with one of our highly trained professionals to get started on the addition of your floors today. We are committed to being your knowledgeable flooring expert. We’ll tell you about different features, whether you’re looking for a certain look or type of wood such as hand-scraped or pecan wood. Also, wood flooring has a specialized construction. When it comes to your interior décor, what type of style are you trying to capture? Thanks to our wide selection of hardwood floors, you’ll have plenty of opportunities to see which type of hardwood floor is best suited for you and your home. View our stunning collection of hardwood floors that come in various colors, finishes, grains, and textures. Whether your style is rustic, contemporary, modern, craftsman, traditional, Victorian, or bungalow, our flooring store is sure to having a surface that captivates your attention. Speak with one of our associates to see samples of all of our hardwood surfaces. If you’re a customer who’s just as passionate about the carbon footprint you leave on the Earth as you are about decorating, then engineered hardwood flooring is the perfect surface for you. Fewer trees are required to produce engineered floors, which helps promote a green lifestyle in your home. You can add a touch of luxuriousness to your home and all at an affordable cost. Engineered hardwood flooring is constructed of thin sheets, or piles, of wood that are bonded together to form single plank. What makes these bonded planks so advantageous is the way they’re structured. Each pile is laid in an opposite direction, which allows them to become moisture resistant. The wood won’t crack or bend during varying changes in temperature and moisture. This makes them particularly useful in moisture-prone areas, such as the kitchen, bathroom, and basement. One of the most popular and desired surfaces are solid hardwood floors. If you’re a homeowner who likes to change the look of your space every few years, then solid floors are an ideal surface. The beauty of them is that they typically come unfinished, which allows you to customize them to your liking. Find a grain, color, or finish that fits your style today and ten years from now, you can choose a new grain, color, or finish. These floors are also able to be recoated and refinished multiple times through their lifespan. This gives an added edge to any homeowner who is keen on keeping their home updated with the times. There are so many things you can do to increase the property value of your home, but one of the most popular ways to increase its value is to add hardwood floors. Many prospective homebuyers look at the quality and the type of floor in a home when determining to make an offer or not. The installation of new hardwood floors is sure to give you a leg-up in the home market. Even if you’re not thinking about selling your home now, hardwood floors are a great investment for the future. Stop by our store and speak to one of our associates about the opportunities wood floors can bring you. You’ve finally decided on what type of hardwood floors you want and now it’s time to install them. Trust our experienced professionals to handle your hardwood flooring installation with care and precision. Our flooring specialists have years of experience installing floors of all kinds, so you don’t have to worry about your floors getting damaged during the installation process. Having someone with little to no experience install your floors could prove to be costly down the road. The potential for an improper installation increases if you trust your job to an amateur. We do not want to see your investment suffer due to the carelessness and inexperience of others.